Buy a poster of The Sopranos house layout! 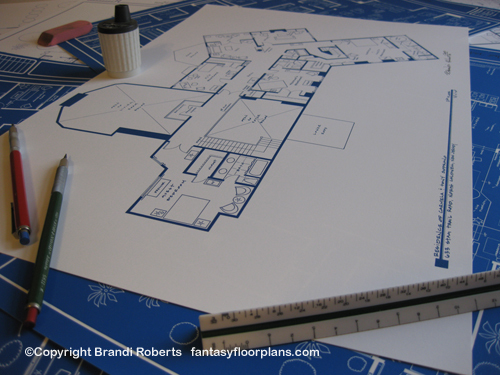 The Office/Dunder Mifflin Paper Co.
What's on my drafting table? 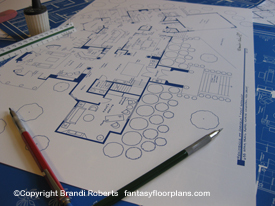 This is my fictional second story house layout of Carmela Soprano and Tony Soprano's mini mansion. It features four bedrooms and four full baths. Carmela and Tony's bedroom has a large master closet and master bath with jetted tub. Meadow and A.J. each have their own rooms and there is a guest suite at the top of the stairs. The balcony over the living room offers a birds eye view of your guests and furnishings. The bridge over the foyer offers an impressive view of the entry. Also upstairs is a den with a balcony and a study with fireplace. My Soprano's house layout is a great conversation piece! Pair it with my first floor for the complete set! 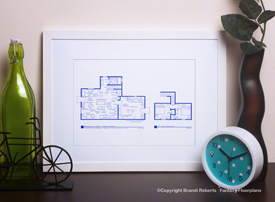 This print is reproduced from my original and expertly hand-drafted drawing. Printed on archival, matte paper with fade resistant inks. For more information about my prints and their packaging, please visit this page or scroll through the images above. ©Copyright Brandi Roberts. Copyright not transferable with sale. ©Copyright 2011-2019 Brandi Roberts. Artist retains all copyrights to images, artwork, etc. Copyright doesn't transfer with sale.